"Our government continues to ignore the seriousness and causes of the climate crisis. It is pure evil," said Yvon Chouinard, Patagonia's founder. 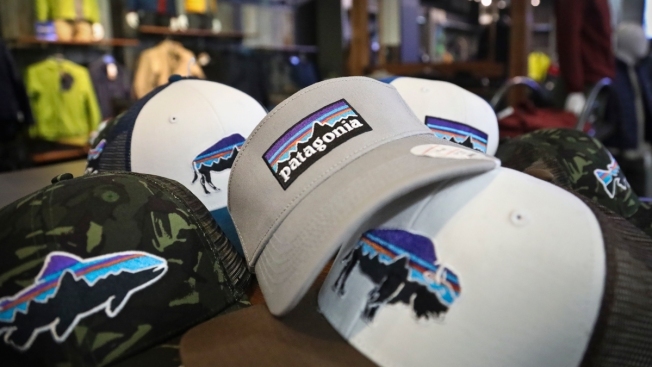 This photo shows the Patagonia logo on items in the brand section of a retail department store Wednesday, Nov. 28, 2018, in New York. Patagonia, an outdoor gear company, is passing along the $10 million it saved from tax cuts to non-profit environmental groups. Patagonia, the outdoor gear company, is passing along the $10 million it saved from tax cuts to non-profit environmental groups. Corporations received a windfall from the GOP's sweeping overhaul of the U.S. tax code last year, which slashed corporate rates from 35 percent, to 21 percent. The California company said Wednesday that the donation is in addition to 1 percent of sales it gives to environmental groups every year. The donation is being made on the heels of the recent National Climate Assessment, which Patagonia cited in its announcement. "Our government continues to ignore the seriousness and causes of the climate crisis. It is pure evil," said Yvon Chouinard, Patagonia's founder. "We need to double down on renewable energy solutions. We need an agriculture system that supports small family farms and ranches, not one that rewards chemical companies intent on destroying our planet and poisoning our food. And we need to protect our public lands and waters because they are all we have left." The report warned that natural disasters are worsening in the U.S. because of global warming. It said violent weather and floods have led to costs of nearly $400 billion since 2015 and the potential for annual losses hundreds of billions of dollars. Though economists agree with the general financial conclusions related to climate change, President Donald Trump has rejected the report's assessment regarding the potential economic impact. Patagonia, based in Ventura, California, has joined a flurry of lawsuits challenging Trump's decision to chop up two large national monuments in Utah. It also endorsed Democratic Sens.-elect Jon Tester of Montana and Jacky Rosen of Nevada, both who won against GOP incumbents. The company described them as champions of public lands and the outdoor industry.